Sailboat Racing: The People and Technology Taking on the World’s Best - Communication Plaza | Yamaha Motor Co., Ltd. The Plaza is making various changes to its display areas throughout June and July as it welcomes visitors. With summer now in full swing, part of these changes includes the new sailboat display on the center stage of the 1st-floor Symbol Zone. 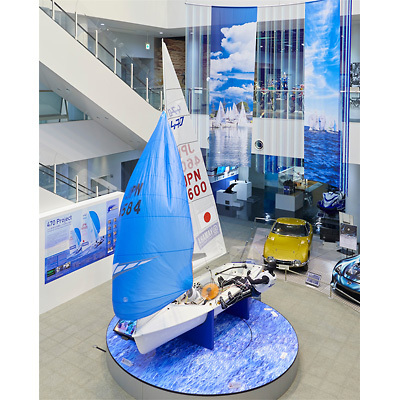 This is the first time for Yamaha’s 470CPG dinghy—built under license in Japan for 470 class racing—to be displayed in the Plaza. 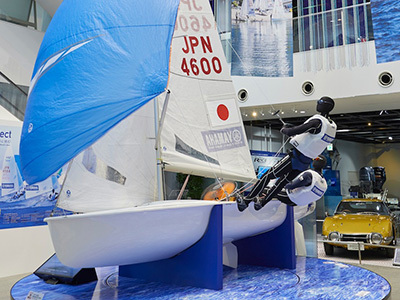 The display includes information about YAMAHA Sailing Team ‘Revs’ and its members competing in several world championships, the AUS11 sailing team from Australia providing sailing-related support and instruction, and the technology behind and development of the craft itself. We hope you take the opportunity to see the 470 craft up close and get an idea of how it cuts through the waves with the wind in its sails when racing at the top of the sport.